At the beginning of this year we got the pleasure to meet new coordinator of the EUROSHA project. After a warm welcome she gave us interesting assignment. Questions about our mission raised at perfect time – just in the middle of our EUROSHA journey. Questions on which answers might look easy and obvious but closer look at them require deeper reflection. Even though we have daily discussions about different dimensions of the project these questions gave me an opportunity to sit down, “go back to Plaisians”, remember how things have started, what have we wanted to achieve, how mission has developed and where do we stand now – after almost 5 months abroad. How far have we come – professionally and personally? Questions made us think about our adaptation to Kenya, its life and its people, our work and achievements, living and working in a team, skills we have gained and our commitment to project. And in addition our coordinator made us think about our possible re-deployment to Burundi. Why re-deployment? In the blog posts of our team you already had many chances to read about the topic of recurrent election violence in Kenya. In the 2007/2008 poll chaos, 1,300 people were killed and over 600,000 others displaced from their homes. And this is also one of the reasons why Kenya was selected as one of the deployment countries in the framework of the EUROSHA project. And the next general elections are set for 4 March this year. So there come the questions. Will Kenya be able to pull off successful elections? Will there be violence? Is EUROSHA team in Kenya in danger? I guess there is no one who can really know what will happen, there are just predictions, current realities and many different opinions and interpretations. There is a fact that media and different (international) organizations are already reporting about insecurity and pre-election disturbances and violence across the country. There were chaotic party primaries. All across the country Kenyans were waiting patiently at polling centres hoping to exercise their rights. And all across the country there were stories of election officials, ballot papers and buckets boxes that did not arrive. In slums political temperatures are rising day in day out. Umati project, an initiative of technology incubator, iHub, and software developer, Ushahidi, which is following opinions and political leaders and collecting data from Twitter, Facebook, blog posts and comments have found more dangerous speech than expected. Despite few reforms police operations and procedures that were in place five years ago have remained unchanged and there is a lack of preparedness by the Kenya Police Service to guarantee peaceful elections. Many issues that triggered election violence in 2007 such as negative ethnicity, competition for land and resources and youth unemployment still remain unresolved. All this is very worrying. But did someone expect that in 5 years Kenya will be 100% ready for peaceful elections without any flaws? Is it realistic to expect that any country can completely heal after the scale of violence witnessed in 2007/2008? And on the other hand there is definitely a hope. Election experts and observers are predicting that Kenyans will have more peaceful General Election compared to the traumatic 2007 poll. They say that the weighty ICC cases facing four Kenyans, the political structures created by the new Constitution, creation of institutions that monitor hate speech, the prosecution of senior people caught mongering hate speech, the independence demonstrated by the new Judiciary who is also enjoying unprecedented public confidence, a fresh election commission and more vibrant media have contributed to more relaxed national campaign. And even president Obama stressed the need to prove to the world that despite the 2007/8 election violence, Kenya is still East African’s beacon of peace. There were a lot of peace-building activities done during the last 5 years and most of the local authorities and local people with whom we were in contact with are convinced that there would be no major violence. Even in Molo, one of the hotspots during previous elections. So what will happen to our team before, during, after the elections? There were doubts, discussions, personal preferences and guessing. And there was a moment of truth, a final decision. Partners of the EUROSHA project agreed on our “evacuation” to Burundi. There were so many questions and thoughts running through my mind. Why? Is it necessary? Are we in danger? Or is this solution just the easiest one? Why people in charge were not thinking about the election, possible scenarios and solutions even before our deployment? How we will continue with our work? Will re-deployment have negative impact on achieving our goals? How will we adapt to the new country? I knew I have to find answers on these questions at least for myself. And I did. After putting all emotions aside. Maybe some of my questions don’t have clear answers and they will never have it (maybe it’s not even important to have all the answers, especially when there is the question of security and safety in the play?) but sometimes you just need to be very reasonable, adapt to situation and simply try to make the best of it! We have arrived to Jomo Kenyatta airport in Nairobi in October 2012. 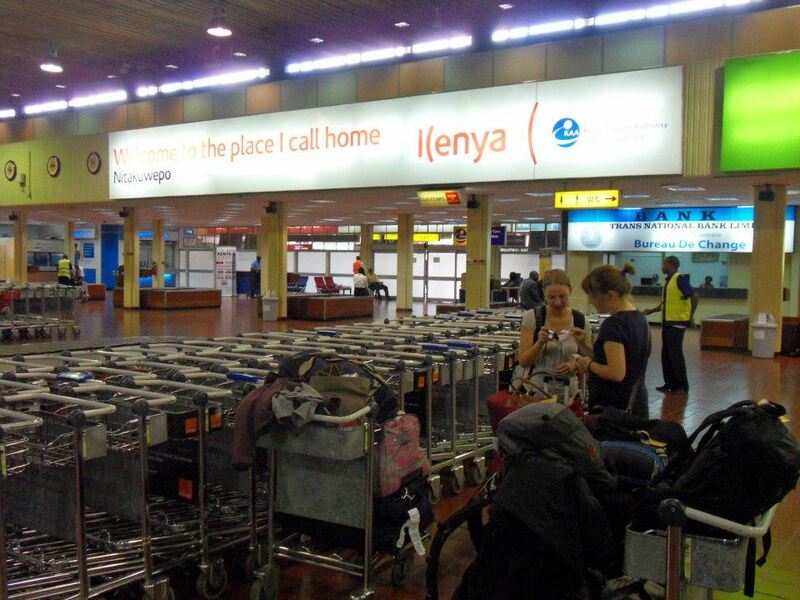 And while waiting for luggage it is almost impossible to miss the big sign saying »Welcome to the place I call home – Kenya«. That time it was a fact that we will stay in Kenya for 6 months but I was thinking if it is possible that Kenya would become our “home”? If Kenya can really become a place where you feel comfortable, safe and loved? I had big doubts. But now, not even 6 months later, I know it is possible! With all its beauties and flaws Kenya was not simply a deployment country but my home for almost 5 months. Because of the EUROSHA girls (especially my roomy J), our two Kenyan volunteers, NECOFA staff, our trainees, organizations and local authorities we have worked with and most of other Kenyans who made us feel welcomed. And last but not least – because of its breath taking nature that in some parts, especially Rift Valley, resembles so much to Slovenian one. Kenya – ASANTE SANA!